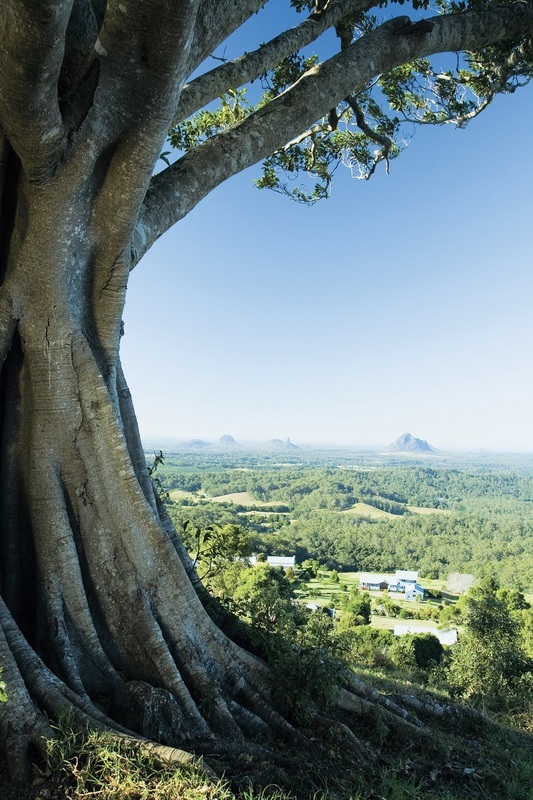 When falling leaves drift by the window, birds tweet about migration, and summer cottons give way to warm woollies, it’s time says Helen Flanagan for an escape to the Sunshine Coast hinterland. Delicious winter. The verdant Blackall Range, is dotted with country estates boasting orchards of juicy fruit ripe for picking, occasional roadside stalls brim with bunches and boxes of fresh produce beside an obligatory honesty box, and farmers on small holdings who cultivate anything from Asian herbs, raspberries and pomelos or nurture snails, quails, pheasants and milk- producing buffalos, cattle and camels. Sticky sweets, cheese and pie shops, art galleries, boutiques and busy cafes lure tourists to ‘doyly’ townships such as Montville. Narrow roads offer views of the Glasshouse Mountains or the apartment-strewn coast below, wellness retreats and secluded cabins hug nature, and gravel driveways fringed with trim hedges, hydrangeas and gardenias, lead to elegant accommodation options such as the extraordinary, as opposed to the ordinary, Spicers Clovelly Estate. It is un petit paradis trouvé which echoes provincial France and effuses the joie de vivre of old world charm in a contemporary setting. 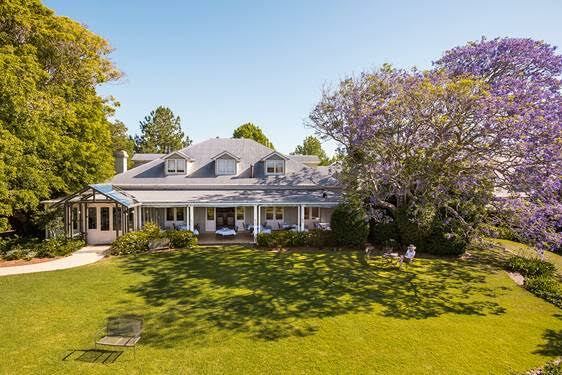 First settled by the Brown family in 1908, these days the nine hectare estate is part of the decadent Spicers Retreats Hotels and Lodges group, owned by Flight Centre’s founder Graham Turner and wife Jude who also own a home in Noosa. Jude’s design touches are evident throughout, from large Bordeaux-style arm chairs complete with alpaca throws, recliners, French Oak bookcases and sideboards adorning the lounge areas to beautiful contemporary French furnishings and lavish linens in the extra roomy suites. Devotees of degustations, long lunches and romantic dinners will adore the much acclaimed 2-hatted Long Apron where French doors openly invite eating al fresco. 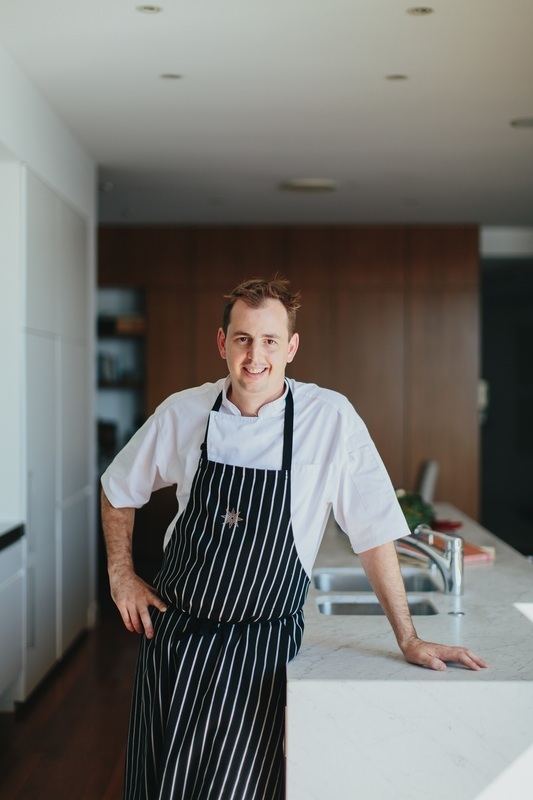 “We use the local ‘terroir’, the provenance of where we live to define what we cook,” explains super-talented executive chef and hotel general manager Cameron Matthews, whose cooking classes are also a big hit. 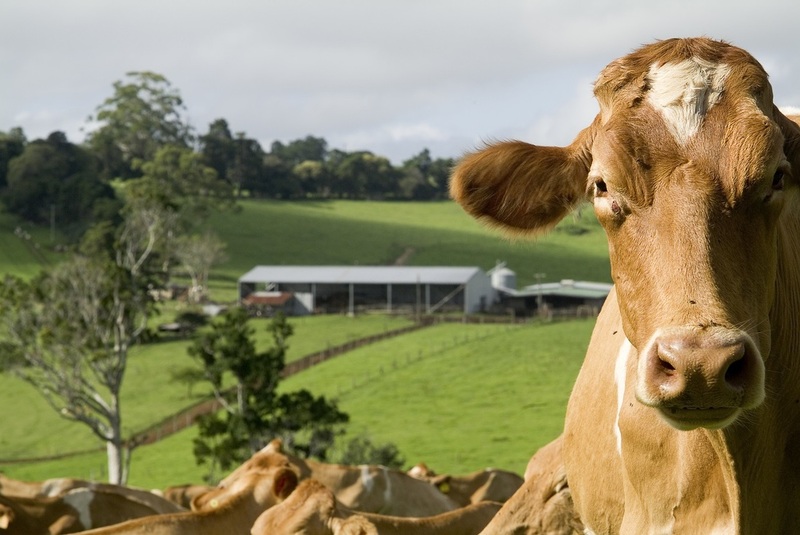 “This is Australia’s most underrated food region and it is the relationship with local producers that dictates our cuisine: paddock to plate, root to tip, tail to snout. Expect the unexpected: fried and poached Fraser isle spanner crab, macadamia romesco, burnt lemon; kangaroo tail, native berries, buffalo curd, roasted watermelon jus; and malted potato ice cream, miso caramel chocolate mousse, hay ash and beer. Spicers Tamarind Retreat & Spa is perched on a ridge next to Gardners Falls in Maleny amid film-set seductive lush gardens, tropical rainforest, and a soundtrack of chattering birdlife. It is also home to a 2-hatted restaurant where executive chef Daniel Jarrett’s approach to sparky Asian fare is evident in share-friendly dishes. Or a degustation if you prefer. Crisp veal sweetbreads, spicy Korean sauce, local prawn, carrot raisins, samphire and sesame cream is a triumph, ditto crisp whole fish with a chilli, tamarind and pickled garlic sauce, and crispy basil. Indulge the urge to pick every morsel from the cheeks, wings and tail - it’s worth it. Clever Daniel champions the unique flavours of Asia using local ingredients yet challenges the boundaries to perpetually surprise and delight guests and cooking class attendees. Satiated after such an extravagance? There’s nothing quite like disappearing to Spa Anise for a pamper or revelling in your Forest Villa with its wood-burning fireplace, soaking in a patchouli-laced bath or if the weather is on your side, a glass of something and a snooze on the king-size day bed, could be just the ticket. Next stop? How about a city-fix 100km down the road to Brisbane’s and Spicers Balfour Hotel, which has added eight new luxe suites mimicking the building’s Art Deco style. With spectacular views of the Story Bridge and delicious canapés served daily from 6pm for in-house guests, make the rooftop bar your first stop. 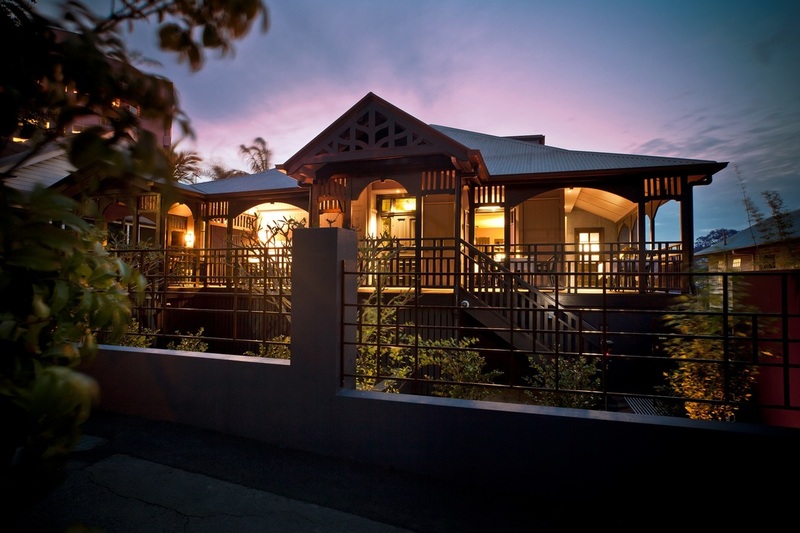 Second is the Balfour Kitchen, an intimate neighbourhood restaurant with a Queenslander wrap-around verandah and intimate courtyard, shaded by Frangipani trees. “The modern Australian menu is all about a no-fuss dining where the food speaks for itself,” explains executive chef William Wallace, who is thrilled by the response to the new share-style menu. Nothing stokes our wanderlust more than a unique setting with an experience reflective of its location. And Spicers also has the unbridled most luxurious way of putting back everything life takes out. It’s worth the detour. The Blackall Range is about 100km north of Brisbane.